This has not changed since my initial review: both Vitacost and iHerb are trustworthy sites that have been on the supplement, health food and natural product market for many years. They both sell authentic products and I have never had a single issue with expiration dates. iHerb.com is an online retailer that offers primarily supplements, and also a wide range of eco-friendly cleaning, makeup and food products. They are based in California, have been in business since 1996 and ship all over the world. You can connect with iHerb through their website, and find them on facebook, twitter, instagram and youtube. Vitacost.com launched as an online store in 1999 and was a health and wellness products catalog before that. Located in South Florida, they offer international shipping and sell a lot of supplements under their own Vitacost brand. You can also connect with Vitacost through their website, and find them on facebook, twitter, instagram and youtube. They have one retail store in Las Vegas. Winner: tie – not a huge difference between the two. Vitacost vs iHerb selection has definitely changed quite a bit since 2013. Back then, both companies claimed to sell over 35 000 different products, and iHerb was the winner as they had a slightly better catalog of products. Fast forward to 2016, Vitacost has expanded their product range greatly. iHerb offers 35 000 products from 1200 different brands. Vitacost now boasts over 45 000 products from more than 2500 leading brands. In 2013 I wrote that I could find most Vitacost products on iHerb, but not vice versa. In 2016 the tables have turned, and I feel that the main change has come from iHerb focusing primarily on supplements, while Vitacost now offers a lot of health food, beauty and eco cleaning products that are not available through iHerb. Winner: Vitacost. The recent changes might not make a huge difference for those who buy primarily supplements, but I personally order a lot of the other items that Vitacost has to offer and prefer their selection. Laundry detergent, cleaning supplies, healthy snacks, Dr. Bronner’s soap – you name it, Vitacost has it. iHerb has rolled out some changes to their first time buyer discount, while the Vitacost discount has remained the same. They used to offer $10 off of purchases $40+ and $5 off $25+, but now only the $5 discount is left. Update November 2016: iHerb has changed things again, now they offer 10% off the first offer. Update March 2017: changes yet again, now the first-time discount is $5. iHerb offers 10% off of your first order when you follow this link and use code WELCOME5, and free shipping over $35 in the US. Vitacost offers $5 off your first order, with a minimum purchase of $30. You need to create a Vitacost account through this link to receive the discount – the code will show once you click “Submit”. Winner: Vitacost. They offer a more generous discount, although I wish they would offer a code like iHerb instead of asking that people register. Also, iHerb has changed their discount so many times over the past couple of years it’s making my head hurt! Seriously, just stick with something already. iHerb – I have not had much personal experience with iHerb customer service. Once I contacted them to let them know of an out of date ingredients list on one of their products, and never received any kind of follow up, and last I checked the ingredients list remained the same several weeks after I wrote them about the issue. Vitacost – these guys are AMAZING when it comes to customer service. I honestly have never experienced anything quite like it. They actually offer returns on items you did not like! Every single interaction I’ve had with them has left me feeling like a valued customer. One time I accidentally ordered the wrong flavor of Vega One , and they actually refunded me for it, even though it was my mistake and not theirs! It really does not get any much better than this. Winner: Vitacost hands down. Easily the best customer service I have ever encountered with any online retailer. Vitacost: a tabbed layout that defaults to all the customer reviews and product overview. iHerb product view: the expiration date is immediately visible. The Vitacost vs iHerb websites look surprisingly similar to the 2013 versions, but there have been some slight changes. One thing they have in common is that both sites are safe and encrypted, so you do not have to worry about giving out your credit card information. iHerb – as I mentioned in the previous review, the iHerb website is definitely not going to win any design awards: let’s be frank, it looks quite dated. However it’s quite easy to navigate and what I love is that the expiration date of the item is immediately visible. International shoppers will also like that the shipping weight is right at the top of the page. What I do not like is that in order to read product reviews you have to click on the stars at the top of the page – you can’t just scroll down. The ingredients and product details are listed on the overview page, but you have to scroll down to get to them. Vitacost – they definitely have a sleeker, more modern looking site, and while they kept the tabbed layout that I wasn’t a fan of in 2013, they made information more easily accessible in 2016. Now you have two sets of tabs: one defaults to customer reviews and the second to a product overview. You can find the ingredients in the “Supplement Facts” tab to the left of the product details – I’m used to this layout, but for first time shoppers it might be a little confusing. The shipping weight is also clearly visible, however expiration dates are not shown and to me that’s a shame! Winner: Vitacost – the iHerb site shows expiration date and has the ingredients clearly visible, but accessing the reviews is not straightforward and requires clicking through (and then back since there is no option to add product to cart from the reviews section). The Vitacost site readily displays the reviews, but does not show expiration date and getting to the ingredients list might be confusing for first time users. But what I find a lot more convenient on the Vitacost website is being able to put items in your cart without having to click on the item listing first (see screenshots below). iHerb offers free 1-5 day shipping on domestic orders of $35+ (this is after any discounts have been applied – another change from 2013), and $4 flat rate shipping on orders of less than $20. Their packaging has been hit or miss, with some boxes showing a lot of wear upon delivery. Vitacost offers free 1-4 day shipping on orders over $49 (or $25 of Vitacost and select other brand products; after all discounts), $4.99 flat rate on anything under. They do a phenomenal job of carefully packaging each item and using cardboard dividers in boxes to make sure that everything arrives intact. There is also a new Free Shipping section full of items that make your whole order ship free. Winner: tie – while I would love to give the prize to Vitacost just because their shipments have some of the best packaging I’ve ever experienced, their free shipping cutoff is over 2x that of iHerb, and for smaller orders that makes a difference. Both companies use good shipping partners, and I’ve never had a package get lost or delivered after the estimated delivery date. This time around I decided to compare Vitacost vs iHerb international shipping in a separate category, since there are always a lot of questions in the comments about that. Now, let me say right away that I am based in the US, so I do not have any personal experience with international shipping from either company. I can only go off of what I see on their sites and what my readers have told me. In the screenshots above and below I tested out shipping charges for a mock order of three bottles of Maxi-Hair vitamins to three countries: Australia, Russia, Sweden. 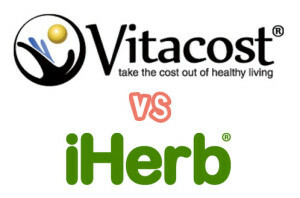 You can see the Vitacost vs iHerb estimated shipping cost by clicking on the thumbnail. iHerb used to be very well known for inexpensive international shipping. They even have built out translated sites and multi-language support to cater to international customers. But in late 2014 they changed their rates and that caused an uproar among the international customer community. You can read more about that at my old blog in this post. However, it seems that even after the change their international shipping rates are much lower than any US based competitors. Vitacost offers international shipping as well, but I don’t think that international sales are a huge focus for the company. Their rates are not as low as iHerb is able to provide, and I doubt they have a similar volume of sales outside the US. Winner: iHerb – in spite of recent changes and complaints, I feel that their rates are just so much lower than Vitacost is able to offer. In the three sample countries I selected, all three had a free shipping option. And you can’t beat free shipping! Winner: Vitacost. The price difference isn’t huge, but Vitacost is still on average less expensive than its competitor. Just a small reminder – you can follow this Vitacost link to get $5 off of your first order of $30, and you can follow this link and use code WELCOME5 for $5 off of your first iHerb order. iHerb has just rolled out an “iHerb Loyalty Credit” program: 5% of your order (not including shipping) posts to your account as a credit towards your next order. The iHerb Loyalty credit expires after 60 days. So if you place a $50 order today, you will be able to get $2.50 off your next order. iHerb also offers a volume discount on many items, which allows you to save 5% and more. The volume discount can be combined with the iHerb Loyalty Credit. Vitacost offers 3% cash back through Ebates (not a member? Get a $10 gift card when you sign up), and I’ve seen this go up to 6% on some days. There are also regular email and snail mail offers to save 10-15% off your whole order, as well as regular additional 15-20% discounts on their top brands such as Megafood, Avalon Organics, Ecover etc. The tricky part is stacking these deals. For the most part you can combine brand/individual item discounts with one % or $ off code. So for example if you take advantage of the $5 off of $30 offer by signing up via this link, you will be able to take advantage of current deals such as 20% off of Kind Organics supplements with code MYKIND (expires Feb 1, 2016), but won’t be able to stack the $5 off of $55 offer with code SAVEON55 (expires January 28, 2016) on top of that. MORE FROM OLGA’S LAUNDRY Miele W3038 Washing Machine Review: Is It Worth the High Cost? Winner: tie – I love that Vitacost allows cash back through ebates, and love the ever changing generous sales and coupons they offer. At the same time coupled with a lower free shipping requirement, iHerb’s new Loyalty Credit is quite generous – if you order on a regular basis you will effectively be getting 10% off your order all the time. iHerb Here’s another area where iHerb has had significant change since I last reviewed the Vitacost vs iHerb differences. iHerb used to allow one free sample item with your order (with plenty to choose from), however now the samples are offered at an extra cost. While most items are under $1, it’s still a lot less fun than getting a freebie with every order. They do however throw in an iHerb branded item such as a pen or tape measure. Vitacost never offered the same amount of freebies as iHerb, so not much change there. They do have a Vitacost Free Samples page, however I can’t recall the last time I saw anything other than that Toms of Maine deodorant sample on there. Also a couple of times they have sent free food samples such as Kind bars with my order, but that’s pretty rare. Update November 2016: free samples are no longer offered, however almost every shipment comes with a Vitalize with Vitacost magazine that has a unique 10% off discount code printed on the back. Best of all, this code can be combined with most other codes! Winner: tie – while freebies used to be iHerb’s competitive advantage, nowadays you can expect to get what you’ve ordered and not much more on top of that. I have to say, I miss the days of iHerb samples! So, Vitacost vs iHerb 2016. Let’s break this down: in this review I judged the two competitors based on 10 categories, and Vitacost took the lead in five of those categories (most of the others resulting in a tie) making it the overall better choice for most people. This isn’t to say that you should never order from iHerb – on the contrary, as I’ve said before I am a loyal and frequent customer of both Vitacost and iHerb. But if I was forced to choose just one, as of today my vote would be for Vitacost. Vitacost was also the winner in my 2013 review, so they are definitely showing some consistency! That being said, for smaller supplement orders and/or for international shoppers iHerb might be the better choice. As I concluded last time, it’s great to have both options available – as we know the consumer always wins when there is healthy competition! I’d love to hear your thoughts on Vitacost vs iHerb – which do you prefer? Register through this Vitacost link to get $5 off of your first order of $30+, and follow this link and use code WELCOME5 to get $5 off of your first iHerb order. Awesome post. I am appreciate you taking the time to maintain the excellent site and this is very good topic i herb that is more important for our health. I really like your post and content and coupon code system idea really beneficial for everyone. Hi, its pleasant post regarding media print, we all understand media is a wonderful source of facts. Your site was just what I was looking for. I am from Australia and I agree that Vitacost have a better range of products. However, I purchase from iHerb because their delivery charges are much cheaper. If only Vitacost would match iHerb’s international delivery charges, I’d certainly be buying from them, and so would many others! Thanks for your comment, Liz! I know, you really can’t beat those shipping fees… I hope one day you’ll be able to get access to more US based retailers with reasonable shipping costs – there has to be a huge market for that. As a (possibly soon to be former) long-term iHerb customer, I have to disagree about their current “loyalty credit” system. Previously, returning customers got a discount on their order scaled to the value of that order – the more you bought, the more you saved and it applied directly to that order. Or the fact that the best price on my daily multi (TwinLab Daily One without Iron) comes in the 180-capsule jar; that’s a 6 month supply right there. If they were to make the expiry term 6 months, I wouldn’t find it so obnoxious, but as it is – I’m definitely going to be checking out VitaCost! Thanks so much for the comment, George! I can’t really fault iHerb for wanting to sell more and creating programs that would stimulate that, but I can see how some people would prefer the older setup. The main difference between the promo strategies of these two companies is that Vitacost offers only “unpredictable” flash sales (so you never know when which category will go on sale) while iHerb has some of that but also their volume and loyalty discounts available all the time. That being said I’ve generally found the sales to be more generous on Vitacost and the regular prices a smidge lower there as well. So it might be worth stocking up on your supplements when Vitacost has them on sale for 15-20% off! I can’t blame them for wanting to improve sales either, Olga – but the way they’ve chosen – “buy frequently or you lose your bonus” – just grates on me. I could see iHerb’s new system not being a problem if someone had a sizeable family and were for various reasons placing an order (say) every month – but in my case it’s just me, and I’d actually made an effort to try and “sync up” my supplements so I didn’t have to constantly be placing orders. I see your point about VitaCost’s flash sales, but I did a comparison using the order I was about to place with iHerb – and even with only one brand I was interested in on sale, VitaCost came in under iHerb, even counting the “loyalty discount” against that order… and when I switched some products to VitaCost’s house brand – the total dropped even further. I think I’ll wind up seeing the flash sales as a “pleasant surprise” rather than a baseline discount I’m depending on. We’ll see how the shipping goes; as I live in the same area as iHerb, their delivery was always very quick. In any case, the nice thing about variety is that people with different needs and priorities can find something that fits; thanks again for the tip about VitaCost. I have the same experience with prices being lower – to be honest I buy 80-90% of the time from Vitacost nowadays and use iHerb only when I have a small order that doesn’t qualify for free shipping there. I hope the shipping times are reasonable for you – I’m on the East Coast and they always get here faster than I expect. Oh, and wait till you see how well they package everything! Oh, and check your Promo Pocket when you create an account – I had an offer for a free bag of Bob’s Red Mill chia with a $49 purchase! Not sure if everyone gets those or not, but always worth checking before you complete your order. i really like the iherb website , but i couldnot find any discount code , can you pleas share coupon code that really work ? I’m in New Zealand and vitacost is actually cheaper than iherb, unless it’s your first order with iherb, saving you $7 Nz. Iherbs’ DHL shipping estimate sounds faster though on delivery date. I may try I herb next time for this reason. That’s pretty interesting, I think it’s the first report of iHerb’s international shipping rates being higher than Vitacost’s! Iherb have won my future biz. Not only did Vitacost send me the wrong product on my first order, but Iherb now have $6.65 international shipping to my country, NZ, and it’s faster than Vitacost. I can still pay around $19 and get fast DHL shipping in around 4-5 days, but the $6.65 option is only 8 days, so definitely the best deal. Iherb was the better option for international customers until they decided to screw us up and change their delivery method to DHL global mail. This means that an order taxes up to 6 weeks to reach the local customs office, where you then have to wait in a line for more than an hour, pay additional 20%+ 2$ from the global value of the package and have someone open it and question you on every item. I’m so done with them! I’ve been an IHerb loyal customer for many years and though I knew about Vitacost way before I’ve heard of IHerb, I’ve never shopped at Vitacost back then as I assumed they didn’t ship overseas (I live in Asia). This week as I was researching a product for reviews, Google brought me to Vitacost and while I was reading the review I saw that Vitacost does ship overseas. And their prices are lower. So…this google search on Vitacost vs IHerb brought me here. The last time I bought stuff from IHerb was less than a month ago and so far their shipping policy hasn’t change on my side — I still receive my orders pretty fast from the USA to Asia, within a few days’ time as always (the earliest I’ve gotten my order was within 2 working days, ordered on Friday afternoon and received my items on Monday morning), with tracking on DHL, and the shipping cost can’t be beat. Today I’ll try to order a product from both sites and see how much the total with shipping will cost me, and how long is the estimated delivery dates for both, for comparisons sake. What shipping method do you use on iherb? If I order through DHL Global mail, the tracking info is a joke, as it never gets updated and it takes almost 6 weeks for te packet to reach the local customs office. When they used international airmail, I received the order at home, without additional taxes. I only ordered with DHL express once and, although I received my package quite fast the charged me, additional to the shipping I’d already paid, ~ 30$ + vat. So, for a 60$ worth of products I paid 60$ + 8$ shipping+ 16$ VAT+ 30$ DHL tax= 114$ . Never again! I’ve been thinking of ordering with UPS, but I’m a bit put out with iherb at the moment. I am a student and I am writing a SWOT analysis about iHerb . iHerb customer service? is it good or bad? why there is many complaining about iHerb on reviews websites ? is it real? dose iHerb collect information about their customers to personalized their advertisement and offering ? Things seem to have changed. I was a loyal Vitacost customer for years (about 2004 – 2007), but then they went through a “restructuring” stage that they claimed would make it cheaper and more convenient for customers. I live in Japan. Suddenly, orders went from taking exactly 5 days to over a month – and shipping costs went up. I placed about 6 orders like that, and sent inquiries each time after the products hadn`t arrived after 2 weeks. Also, the tracking number used to be correct, but with the changes, the tracking number was not always accurate and the last 2 times seemed inoperable. Since my work schedule was intense and I couldn`t know when to be home for delivery – sometimes shipments languished in some German postal depot for weeks – I found iHerb. I`ve been happy ever since then. IHerb offers the choice of 2 Japanese courier services, and one of the couriers has been free for large shipments. Shipping times differ depending on when you place the order – if orders are placed on Sunday, I might get the item as soon as the following Thursday night but usually on Saturday, which is perfect. IHerb is slightly more expensive than Vitacost. Vitacost`s customer service used to be excellent, but during their “restructuring” phase, it was terrible – either non-existent or actually misleading. If you check the internet for comments about Vitacost`s customer service, you can read some truly alarming reports, at least from a few years ago. On the other hand, I`ve received mixed success with the “notify me” button for out-of-stock items in both websites – sometimes I was notified, sometimes I wasn`t even though the product had been restocked – for both companies. I am one of those people who order frequently, at least once a month, and with supplements on a rotating basis, since I am managing to keep a few inherited health conditions at bay as long as possible. So iHerb`s Loyalty program is useful for me. I`m surprised to see that things have changed so much since then. Thanks for sharing, Eleanor! I do know that most international folks prefer iHerb – I think their business model relies much more on being internationally accessible. As for Vitacost customer service, it has changed greatly over the years and at the moment is one of the best I’ve ever encountered. But this is for domestic customers. You are right, for me Vitacost have a great customer service. Last order I placed didn’t arrive in the 60 days they require before an order is considered lost, I sent an email to customers service, they replied the same day apologizing for the inconvenience and made a full refund immediately. The only problem I have with them, and that deters me from placing any more orders, is the shipping methods they provide. DHL Global Mail is a disgusting mess, they take forever to deliver their orders, if at all, and some products might not look all that pretty after 2 months in transit. The other delivery method available for my country costs 40 freaking dollars + Vat=~50$. From my perspective, that is a lot of money to pay only for shipping. On iherb, on the other hand, you can get your order delivered through UPS, and it is quite cheap if your order is over 40$ and weights <1 kg. Not ideal, but I can usually make it work. On the other hand, I find their custumer service quite mediocre and you need to insist for refunds, especially if more than one of your orders has gone missing. I do miss the good old days when iherb shipped through International Airmail, lots of impulsive buying for me. I’d like to update you on iHerb and some negative changes they have made recently. end up paying more money now if you use iHerb. promo codes on ANY order at any amount you spend. there anymore if you order 2 or more items, you get no more 5% volume discount. and promo codes, so you end up having to spend much more money now. Thanks so much for this comment Joe – I haven’t ordered from iHerb in a while, and was not aware of all this. This is really sad news. I wish the company well, but it looks like they are really struggling to compete in today’s market, and by inflating their prices they sure won’t be gaining any market share… I’ll update the post soon with details. Wish iHerb would actually communicate these things via email when changes are made. Iherb changed their shipping charges for the worse. First they changed from International Airmail to Global Mail. This was a very bad move since all international customers are negatively affected by long delays and increasing duties and taxes. This week they TRIPLED the shipping cost. I used to be a loyal customer but I will no longer order from them. There are too bad changes. I will go with VITACOST in the future. I was a Vitacost customer for about 3-4 years, before they had their disasterous “upgrade,” and then became an iHerb customer for the next 5 years or so – major order at least monthly. They used to offer free shipping to my country. This week, the free shipping option has ceased and the cost of shipping has become a factor. I might try Vitacost again – if the shipping is the same price and they deliver in about 5 days like they used to, I might return to Vitacost, simply because there are more items to choose from. I`m very disappointed with the latest news from iHerb. Thanks Eleanor, iHerb used to be a fantastic option for international customers, I can’t imagine why they would want to do away with all of that. I mean, now they have pretty much nothing left that would differentiate them from other vendors, not to mention how many loyal customers they have left with a bad taste in their mouths. Thanks Iris, so many comments from unhappy iHerb customers – I have no idea why they would do something like that. IHERB had also changed their shipping prices. No longer can you order $20 worth of stuff and get free shipping. It comes up to $7 shipping in my area. I will not be ordering from them. I last ordered on 1/4 and I ordered $20 worth of stuff and it was free shipping like it had always been since I have been ordering from them. Today when I went on I noticed that when I put $20 worth of the same products in, the price said $7 for shipping. I will no longer be ordering from them. Thanks for sharing Tasha, I’m very disappointed with the changes. Yikes, that’s just not right… Thanks for sharing AD, I believe iHerb is really going to suffer the consequences of these recent changes. The only reason I ever bought from iherb and not Vitacost (I much prefer Vitacost’s packaging, it neat and nothing gets banged around) is for small order under $20. Now, I will simply have to wait til I need to make a big enough order on Vitacost in order to qualify for the free ship. I was annoyed that this pretty big change was NOT communicated anywhere on their website. Thanks Marie, I’m pretty annoyed at iHerb myself and will be updating my site soon to reflect the changes. I sent them an email complaining about the increased cost for shipping. Before, shipping to Japan was free if you ordered $40 or more of goods. Earlier in January, they suddenly began charging for shipping, and in fact 25% of the total cost of an order was spent just on shipping. I sent them a complaint about this, and suggested that they look at the comments in this blog. I said that if they continued to make changes as they had done recently that they would lose business. They replied with an apology for the suddenness of the changes, but said that the new shipping charges were accurate and with no offer to change back. They also apologized for their tardiness in responding to my complaint – I guess they were suddenly overwhelmed with other “questions and concerns”. On a whim, while placing an order with Vitacost a few days ago, I checked to see if an item that was not available through Vitacost was available through iHerb. To my joy, I discovered that shipping to Japan was once more free, and this time it applied to not just one shipper but to two major shippers in Japan. So I recommend that you check with iHerb again if you live overseas. You might find recent changes that make them once more competitive with Vitacost. Btw I sent them an email thanking them for returning to the free shipping policy, noting that I realized it might just be temporary, but notifying them that as a consequence of this change I had just placed a large order with them. They responded quickly thanking me for the email, and my goods were immediately shipped – without the one or two day wait that sometimes occurs. Eleanor, thanks for the detailed update! I wonder if they realized the huge amount of damage that was done and decided to revert back to the old model? I honestly think that international customers were their niche, and it would be foolish to give that up since domestically they don’t have much competitive advantage over Vitacost, Amazon etc. Iherb seems to have made some chances, in the last day, or so. Shipping has returned to a decent amount, and you can even get free shipping for some items (apparently k-beauty and some other products, right now, for my country). I wish they’d give us some clues as to how they calculate the shipping, and the items that get reduced/free shipping. Also, you could get UPS shipping for a decent amount, before the new year, but unfortunately that’s not the case anymore. After Drugstore.com went out of business, I needed to find a place to purchase my supplements. So when I read your blog last month, I ordered from Vitacost. I received 10% off and free shipping. Products were great, but it took about a week for me to receive them in Pennsylvania. Yesterday I realized I was almost out of something. I decided to try IHerb. I placed a $70 supplement order (I found the prices were identical to Vitacost). I was only offered $5.00 off my first order , but had the option of FREE overnight shipping! At 11:30 this morning I received my package! I’m very impressed. Sounds like they keep changing their shipping policy, but I lucked out, and hopefully they’ll continue this. I am sure to order from both companies in the future, and I’ll monitor the offers I receive from them. This is a great alternative to Drugstore who always shipped immediately. Thank you for sharing Julie! I’m glad you had a good experience with iHerb, maybe they listened to all the complaints after their recent changes? I talked with the factory owner about that product and he didn’t know how good it was. It was good to see that people like are out there, looking, to make things better. I find Vitcost is much more generous with discounts. iHerb is a tad better with shipping (I’m in Australia) but only for small orders where it can be free. Then they are pretty much the same. But the discounts and promotions from Vitacost usually outweigh the few dollars in shipping you would save with iHerb. Vitacost has changed. They are slowly, but surely dumbing down everywhere. I wish it wasn’t so. I wish it was just a temporary glitch, but they have made their decisions regarding new marketing and that increase in products? It’s mostly, well, crap from the viewpoint of nothing like the wholesome integrity they once had. Even their added packing for shipping is over done, hugely wasteful, and illogical. Just how many layers of paper and plastic are needed for a canned good? They were once a company that truly cared about resources and the actual ingredient label, now they clearly buy based on the marketing label and incompetence has entered the shipping room. At one time, I trusted their brand, but even that quality is going down, starting with added fillers. They have returned to their policy about discounts for ordering 4 of a product. I assume the free shipping to Japan is still in effect but haven`t placed the order yet. If we have to pay for shipping after all, I`ll send an update immediately. IHerb is once again pulling ahead of Vitacost as far as purchasing from Japan. I have only used IHerb but was very dissatisfied with my last order. I live just a 140 miles from their warehouse and have always had free shipping on my orders. I usually order all my wife’s and my items at once and have a bill between $80 and $150. So no problem with free shipping right? Wrong not this time, received a notice that due to either weight or value it could not be shipped by the free method. I was required to pay UPS shipping charges. Since the weight was less than third of the allowable weight of 10 lbs. it was then the value. That is what I consider poor customer relations, charging shipping when a customer spends too much money on your product. Thanks for your major contribution in this comparison. I have recently had my first aggravation with Vita Cost… I have been a customer for ten years or more and have gotten them quite a few converts/new customers. The problem was that, as you have noted, they have had FREE 1-4 day shipping, and I have always qualified. Being on the West coast, I usually receive my order in 4 days or less, and it’s usually marked as coming from Nevada – not far off. I usually gauge my order to my use and “running out” has not been an issue. However, on my most recent order I have a PO box and after placing my order and waiting several days, thought I’d check the shipping date. I was surprised to find I still had a couple of weeks before the scheduled delivery date! By now, my thyroid support is gone and a couple others are waning… So I wrote to ask Vita Cost support why the long wait…Their answer, while I’m sure is the “official story” didn’t leave me encouraged. Since they now use FedEx “smart” (?) post, it can take much longer for an order to reach a PO box. If I want it faster, I have to pay extra for “Expedited” shipping… Probably $10+ more. So this order has been a disappointment. Which, of course was my reason for looking over the internet to find something better. Which of course was how I discovered your information. Thanks for your information – now I’m going to take a look at iHerb. In addition to cheaper international rates, the shipping is 10 times faster, at least from my experience, iHerb uses DHL Express whilst Vitacost use DHL Global. The express reaches me in 3 days from USA to Israel opposing 2-3 weeks shipping from vitacost. So definitely iHerb is way faster. Thanks for sharing, it’s always interesting to hear about international experiences! Great review, I’ve been using iHerb for a little over a year now but I think I will definitely be switching over to Vitacost. After iHerb raised shipping prices and removed certain discounts that I frequently used, I’d save more by just shopping at Vitacost. Another service I was looking at is Thrive Market after reading this review on it https://livingfreshdaily.com/thrive-market-review/ do you have any experience with Thrive Market? They charge a $60 per year membership fee (yikes!) but after comparison shopping between Thrive and Vitacost, Thrive seems to be a little cheaper on most items, very similar on some, and then significantly cheaper on a few items. I think I could pay off the membership fee in savings over Vitacost, but I was wondering if you have tried Thrive Market and could compare it to Vitacost? I can’t find a good comparison between the two services online. Thanks! About Amazon, I can compare experiences for purchases from Amazon.jp (Japan), .com (the US) and .ca (Canada). Often the order from Canada originally comes from the US. In Japan, the items for sale that are comparable to iHerb and Vitacost – herbs, nuts, laundry items, etc – are generally much much MUCH more expensive than the other two Amazon outlets. On the other hand, I buy frequently, so I`ve invested in their Prime Membership, and it has paid off – shipping is free and I can choose the time for items available directly from Amazon.jp. Part of the website can be changed to English (top right hand buttons near login) and you can set your personal account to English – not everything changes, but enough to get by. Shipping is fast – usually 2-3 days. Amazon in Canada and the US might have fast local service – about a week – but shipping is not nearly as dependable as far as timing goes, and it can be expensive. I always try to get items from iHerb (free shipping but about a week wait) because items are cheaper than Amazon (any outlet) and shipping is free cheaper. All use a tracking number if you buy something directly i.e. not a used item from an affiliated seller. One last point, sometimes items are not available through iHerb or Vitacost but are through Amazon.jp – usually nuts, seeds, and other kinds of food. I suspect that there is some kind of import fee that companies have to pay to ship to Japan and if a company is late, they are banned until they pay. Nothing else makes sense. For example, if I want to buy Basmati rice, I would have to do it through Amazon.jp, because it is almost always unavailable through iHerb and Vitacost; and if I want to buy cashew nuts, I can try iHerb and Vitacost and can sometimes get them and sometimes not, but I can always get them through Amazon.jp. Also, I might be able to get cashews (for example) one month from iHerb but not the next month. Finally, if my favorite brand of cashews (for example) is unavailable at this time, I try other brands and sometimes I`ll find a brand of cashews that is available when none of the other brands are. Crazy, but true. Have you looked at the better business bureau comments? They match my experience of Iherb. I have found that iherb’s customer service is terrible. They have removed the phone access to CS. They send standard letters that are not relevant answers to my emails. They made a mistake on the customs declaration with the result that I had VAT and a service charged added by HMRC in the UK. Customer service offered me £5 as a goodwill gesture because they never refund taxes even if it is their fault. The extra amount I had to pay is £20. Iherb warned me that if I refused delivery I would probably get no refund because they do not return the carriage and there is a restocking fee. My problem is that if the value ex delivery is >=£15 on import the extra charges make the import pointless. Vitacost is owned by Kroger. I use to shop Kroger but there were too many times that I got home to find something’s I bought were well passed use by dates. Too many other times there were issues with their loyalty program not giving discounted price. Way too many times I found moldy produce on their shelves. I will not shop Kroger and wish I had known they owned vitacost was owned by them before I ordered from them. You should tell people in your review of them who owns them. Maybe it wouldn’t make much difference to others but maybe it will. 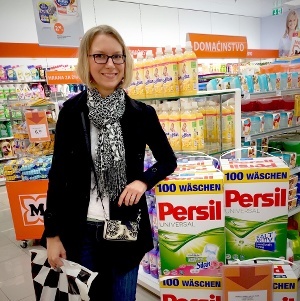 I shopped iHerb for years, internationally. Customer service, shipping time and cost, as well as packaging has become horrible over the past year or so. “Discount” policy seems to have become an outright scam – for example, placed a large order, had ‘loyalty credit’ plus manufacturer discount, paid and had credit card charged. After 4 weeks, temp. charge on card disappears (usually it just changes to regular charge when they ship), received an email that stated “Your order was not charged, please feel free to place again”. Of course, all discounts were gone by that time!?! The last straw was a large, expensive order several months ago, where something happened on the way with DHL, and the package returned to iHerb. I got an email from iHerb stating that they refunded me to the same credit card I payed with. I repeatedly asked them for weeks, they told me it takes up to 30 days to see the refund. After a month had passed, why no refund? The reply (from several different people there) was that they credited my iHerb account; only problem was, they didn’t do that, either!